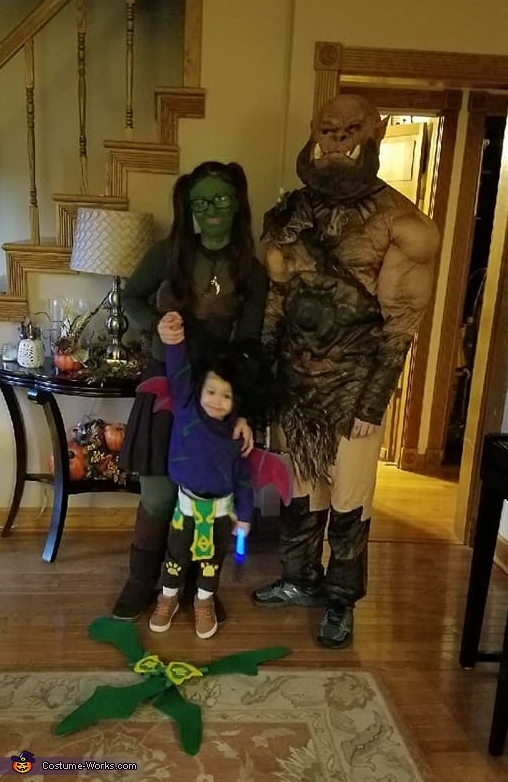 Myself as Garona Halforcen, fiance as Orgrim Doomhammer, and our 3 year old son as Illidan Stormrage - these are world of warcraft inspired costumes! I custom made Illidan & Garona, crafted Illidan's horns, wig, tattoos, wings & attached everything to his purple hoodie. The wings & glaives are wire hangars and stockings with paint. The belt sash is sewn using old T shirts. Garona was put together with a brown skirt, brown bra, brown boots & thigh high socks. I used an olive shirt & leggings for her green orc skin. Then painted myself and did her pig tails. The fiances costume was store bought last minute as his didn't finish properly.